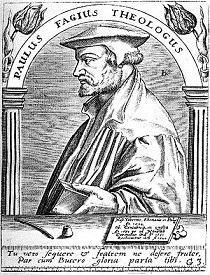 On this date in 1557,* the long-dead bones of the Protestant theologians Martin Bucer and Paulus Phagius (Fagius) were sent to the stake during the Tudor era’s brief Catholic recrudescence under Mary I. 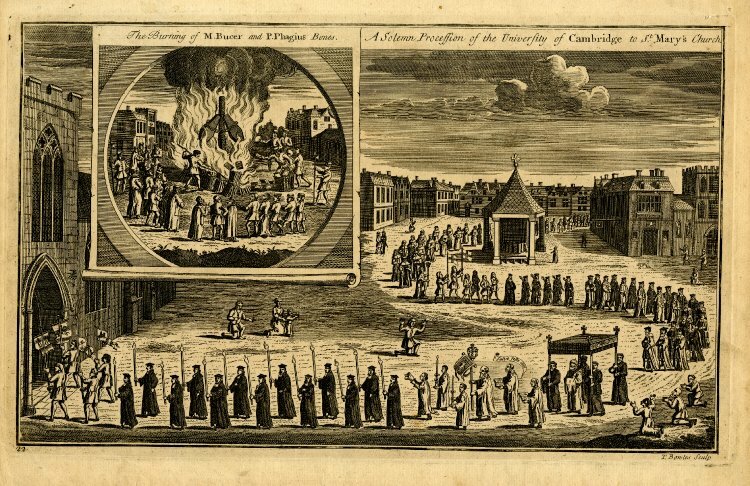 18th century engraving (via the British Museum) shows a procession through the streets of Cambridge, with a separate scene depicting men burning both books and the two scholars in their coffins. Both were Rhenish eminences of the reform movement, such early adopters that they embarked on their heresies from personally attending one of Luther’s earliest disputations, before his doctrines were officially excommunicate. 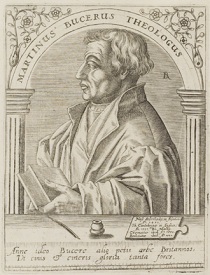 Bucer was a leading figure in the 1530s and 1540s struggle to keep unity among the competing strains of German Protestantism, and maintained an active correspondence with both Luther and Zwingli. 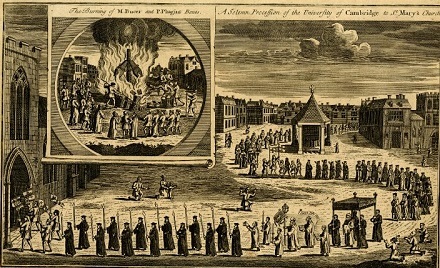 The price of disunity was starkly underscored by the military rollback the Church achieved in the Schmalkaldic War of the late 1540s — and under growing pressure, both men accepted the invitations of Thomas Cranmer to cross the sea and reform the English liturgy. Their labors there were but brief. ** Each appointed to the Cambridge faculty, Phagius promptly died of the plague in 1549; Bucer outlived him, but he was in his late fifties and his health was failing. Before he too died in February of 1551, he produced a treatise to the young king Edward VI on government both ecclesiastical and secular, as well as recommended liturgical revisions that helped shape Cranmer’s 1552 version of the Book of Common Prayer. [I]f God, as he is slow to wrath and vengeance, will wink at it for a time, yet notwithstanding if we, upon whom the charge of the Lord’s flock leaneth, should permit so execrable crimes to escape unpunished, we should not live in quiet one hour. Their condemnation was reversed a few years later, when Mary’s Protestant half-sister Elizabeth I succeeded the throne. * 1557 by our present reckoning; England at the time recognized the new year in March, so it was 1556 to contemporaries. ** Though they hardly had time to make the impact on the English Reformation that they might have aspired to, Bucer had already influenced it in an important way: tracts of Bucer’s from years prior supporting more liberal divorce options, which had made Luther think the man a sybarite, had been fixed upon in the young Cranmer’s effort to construct a respectable theological framework for Henry VIII’s pursuit of Anne Boleyn. On this date in 1557, the handless Mapuche cacique Galvarino was executed by the Spanish during the Arauco War. The Mapuche people, still extant today, inhabited present-day Chile and Argentina; Spanish explorers pushing south from the wreck of the Inca Empire encountered them, and naturally antagonized them. Rebellion broke out among the Mapuche in 1553, led by Caupolican and his able commander Lautaro; they won some signal victories but the conflict was never decisively finished by either side. The Arauco War — encompassing many distinct rebellions and campaigns punctuated by relative calm — ran until the early 19th century. Our fellow Galvarino was elevated to folk hero status by the Spanish in the very first period of rebellion when he was captured in battle at Lagunillas. Instead of cutting off his head, the Europeans chopped off his hands — then sent him (with a number of like mutilated prisoners) back to his people. The intent was to make a terrifying example, but Galvarino made the example his own: brandishing the bloodied stumps and oratorical fury to match, he incited his comrades to further resistance. My Brothers, why have you stopped attacking these Christians, seeing the manifest damage that from the day which they entered our kingdom until today they have done and are doing? And they still will do to you what you see that they have done and they are doing? And still they will do to you what you see that they have done to me, cut your hands off, if you are not diligent in making the most of wreaking destruction on these so injurious people for us and or or our children and women! But by evening, the Spanish carried the day — and once again had Galvarino in their custody. They put him to death straightaway. Accounts of the execution method range from hanging to impalement to being thrown to dogs.